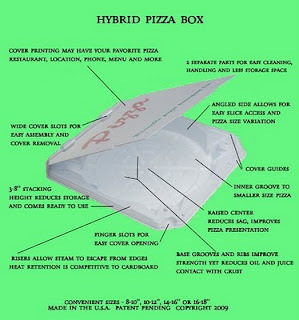 In honor of Earth Day, let's spread some pizza re-cycling awareness...What follows is the answer to recycling pizza boxes. Introducing the reusable pizza box. My response: Three Billion Bill? What can be done about the pizza box problem? Bill pointed me to Mombo's pizza in Santa Rosa, California as a prime example. He said they are using reusable pizza boxes. And this concept has been very successful for the business, their customers and the planet. "Mombo's has introduced the first Re-usable pizza box in the North Bay at Both Mombo's Pizza stores in Santa Rosa and Sebastopol. The box comes in three sizes, 12", 16" and 18". Although the boxes retail for $12.95 each, Mombo's is selling through to our customers at our cost of $10.00 ea. Additionally, Mombo's discounts any pizza purchased by $1.00 every time the box is returned for re-use. This means that after 10 uses the box will have fully paid for itself and thereafter your pizza order will be discounted an additional dollar every time it is re-used." That is just incredible! Mombo's is on board with this idea. Plus they give you a dollar discount for just re-using your pizza box! Earth loving pizza fans need to know more. Where can we get these Re-usable pizza boxes? Who makes them? Are they available to anyone? How can we help? How do we get our local pizzeria involved in this recycling effort? Bill Betz provided me with the inside information! The answer is DMS Innovation. and the inventor of the re-usable pizza box, Mike Sudia. Thank you for your interest and advocacy. It is exciting to meet you...E-mail or audio is fine. So stay tuned. I will be in touch with Mike and find the inside scoop on his incredible product. Re-usable pizza boxes make a lot of sense for the environment. Stay tuned. Pizza Therapy definitely supports the concept of re-usable pizza boxes. It makes a lot of sense... both economically and for our planet! A Wonderful Idea! I'll make a point of telling our local favorite pizza place about this. My only question is for Pizza #2; How do they transport for the second 'zza? The transport guy/owner would ferry the pizza to our door in a cardboard box - or does HE use the recyclable? This can be taken care of in two different ways. 1) You take your recyclable pizza box with you. You order your pizza at the pizza restaurant. When the pizza comes out of the oven, you put the pizza in your box and you are on your way. 2) You have 2 (two) recyclable pizza boxes. One stays at the pizzeria. When you go to pick up your pizza, you give them a recyclable pizza box. Your pizza goes into the other box. So you just keep switching boxes. Now everytime you get a pizza, you revented a pizza box from going into the landfill.